If you are familiar with the note-taking Evernote and Simple Note apps then Turtl wouldn’t be hard for you to wrap your head around. It’s an app that allows you to securely take concise notes along with website bookmarks, articles, and project documentations. It also uses best cryptographic practices to keep your data private while allowing you to share with only whoever you want to share it with. That way you can manage a whole screenplay with your colleagues without the fear of your work leaking. 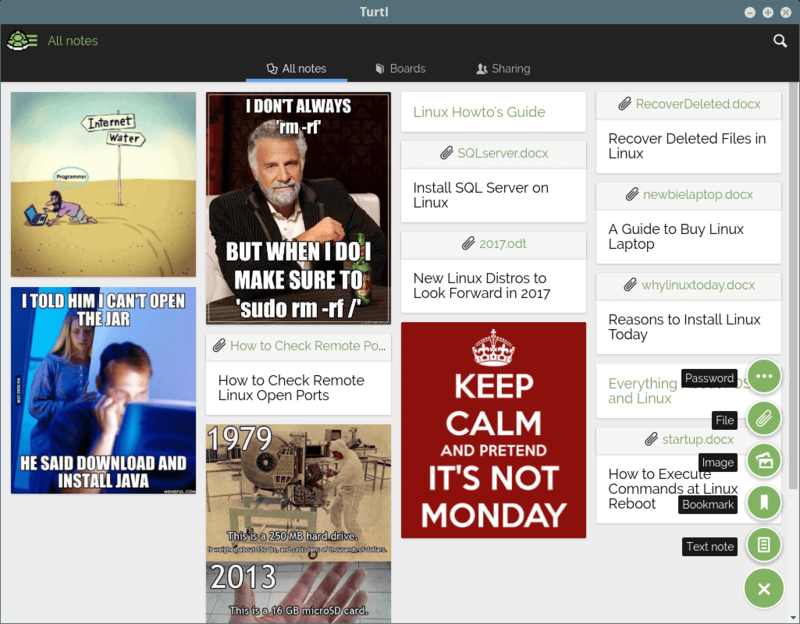 Turtl is an Open Source app available for Windows (x64), Mac OS Linux (x32 & x84), and Android. It has a simple and intuitive UI and it is lightweight. It also has options for easy tagging and filtering to help organize your work more accurately and specifically. Note taking – It has markdown support which makes it easy for the notes to be converted to HTML. Information sharing – You can easily share documents and bookmarks with only the people you want to share to. Privacy – You can share documents with colleagues without fear that your privacy will be compromised. Turtl is fully Open Source and free use and it comes with a limited amount of free cloud storage provided by the Turtl team, themselves. However, if you would like to have more cloud space then you would have to go for the premium version with more space and various features. You can find the download links for Turtl on other platforms here. In case that you want freedom and security of Turtl without purchasing the premium service you are free to run your own Turtl server.